To successfully install vinyl flooring, the subfloor needs to be smooth and flat. Thereafter, you need the right construction adhesive, right preparation, and you are all set to lay your vinyl floor over any clean surface. You can get vinyl flooring sheets in many patterns and colors, including realistic designs that look like wood, stone, and tile, but is available at a very low cost compared to what you would pay if you got the real thing. Vinyl flooring sheets are known for its durability and water resistance, is comfortable to walk on, can easily withstand heavy traffic, and helps reduce noise. Though reasonably priced and versatile, vinyl flooring sheets have some limitations – it can fade if exposed to direct sunlight for longer durations, cannot withstand extreme weather conditions, and can be damaged by sharp objects. Yet, vinyl flooring is still one of the most popular choices as it is affordable, looks great, and if maintained well, can last for a very long time. So, let us now get to learn how to install vinyl flooring. To begin with, you need to measure the width and length and multiply to find out the square footage of the room you will be laying the vinyl floor on. Do not forget to include all nooks and closet areas that will be covered. You must add about 3 inches to every dimension, which will be helpful when you need to trim, cut, or center the pattern. Your total square footage needs to be divided by 9 to find out the total yards that will be required. Usually, vinyl sheet flooring is available in 6 or 12 foot wide rolls. To ensure the vinyl flooring is successfully installed, you need to make sure the subfloor is smooth and flat. 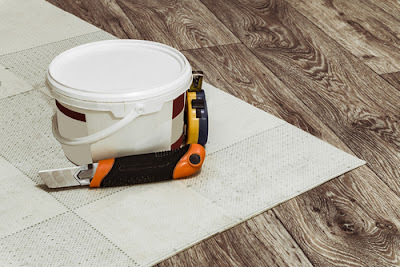 Using the right adhesive and with the right preparation, you can easily install vinyl flooring over any dry and clean surface, like concrete, vinyl and wood. If you want to lay a vinyl sheet over on already existing vinyl floor, make sure any small holes and joints are filled using a patching compound. If there are any adhesive or paints, remove it so that the floor is leveled and plain. Once the compound dries, sand that area and vacuum to get rid of any debris. 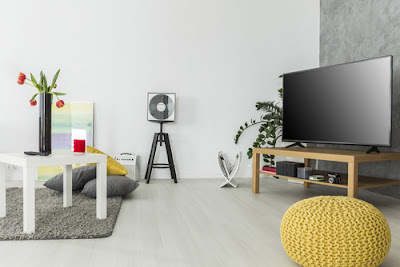 Take the vinyl flooring sheet you will be using and keep it in the room you will be fitting it in and allow it to stay there for at least 48 hours before you begin installing. This will help the sheet adapt to the temperature of the room. 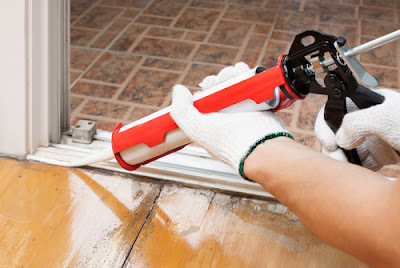 Get rid of any furniture, appliances, or any other obstructions, and remove the thresholds and molding. The door jambs and trims need to be undercut so that you can easily slide your flooring. The flooring must be positioned in the middle of your room. The factory edge of the flooring needs to be aligned with a straight wall in the room; at least you must try to do this to get the best results. This may help you center the pattern in your room, ensuring proper results. If you plan to lay the new flooring over an already existing vinyl floor, make sure the new seams are at about a 6 inches distance from the original seams. Unroll your vinyl sheet and move it under any door casing and jambs. Cut the sheet leaving about 1 1/2 inches everywhere so that it is easier to fit it in non-square rooms, and also so that you can meet any fitting problems easily. Once you have laid down the material properly in the room, make cuts where you need so that the flooring sheet lays perfectly flat on your floor. When your flooring has been cut properly and kept in the right position, now fold half of the sheet back. Take a notched trowel hold it at a 60-degree angle and apply an even, thin adhesive coat on one side of your room on the subfloor. The adhesive supplier mentions the notch size, so make sure you follow that. You should not miss any area, be really careful about this or else you floor can bubble up, and thus all your efforts will go waste. Once you apply the permanent adhesive you can reposition the sheet as long as the adhesive is wet, which is about 15-20 minutes. So, you have that much time before you lay down your floor sheet permanently. You may instead make use of the releasable adhesive that gives you the chance to pull back and remove or re-position your sheet when needed. Now, lay your vinyl sheet back in the right place and press it on the surface properly. Starting from the center, move towards the edges, and get rid of any air bubbles in the process. When you need to cut the flooring sheet along the baseboards, you can make use of straightedge and utility knife. To cut around any obstructions, you should first cut vertically so that the vinyl can lay flat, and then horizontally trim along baseboards. If inside corners have to be trimmed, you should keep cutting little half circles until the sheet lies properly flat on the floor. Once the vinyl has been put into place, use a hand roller to secure it in position and to remove any air bubbles. It takes about 2 -4 hours to create a proper bond. Make sure heavy traffic is avoided in the area for at least 24 hours. · If you find bubbles on the floor, wait for a day and see if it settles. If that does not happen, make a small pinhole in the center on the bubble and once the air releases, inject some glue into this hole using a floor syringe. · If you are installing vinyl flooring with designs that look like wood or tile, position the flooring in a way that the seams will fall naturally in between the planks or on the grout lines. So, now that you know how to install vinyl flooring, wait no more, get all the essential materials, follow the process mentioned above, and get started.